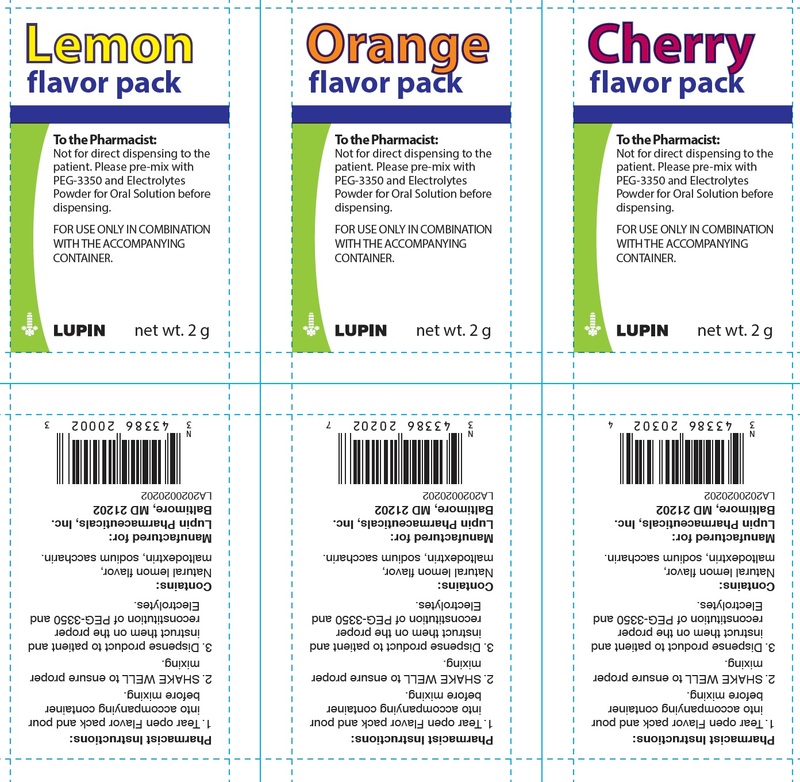 If adding a GaviLyte-N flavor pack, pour the contents of flavor powder (i.e., cherry, lemon or orange) into container prior to reconstitution (2.2). Early in the evening prior to colonoscopy, fill container containing GaviLyte-N powder with lukewarm water to 4 liter fill line (2.2). Pediatric patients (aged 6 months or greater ): Drink 25 mL/kg/hour orally or administer by NGT. Continue drinking until watery stool is clear and free of solid matter (2.3). To report SUSPECTED ADVERSE REACTIONS, contact Lupin Pharmaceuticals, Inc. at 1-866-403-7592 or FDA at 1-800-FDA-1088 or www.fda.gov/medwatch. 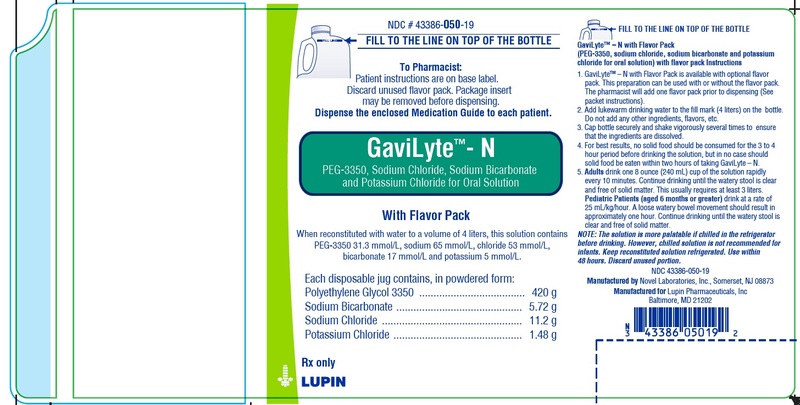 The following is the recommended dose of reconstituted GaviLyte- solution for adults and pediatric patients â‰¥ 6 months. Instruct patients they may consume water or clear liquids during the bowel preparation and after completion of the bowel preparation up until 2 hours before the time of the colonoscopy. The solution is more palatable if chilled prior to administration. Adults: Instruct patients to drink a total of up to 4 liters at a rate of 240 mL (8 oz.) every 10 minutes, until 4 liters are consumed or the rectal effluent is clear. Rapid drinking of each portion is preferred to drinking small amounts continuously. For NGT, rate is 20 -30 mL per minute (1.2 â€“ 1.8 liters per hour). Pediatric Patients â‰¥ 6 Months: Pediatric patients should drink 25 mL/kg/hour until the stool is watery, clear, and free of solid matter. If pediatric patients are unable to drink the reconstituted GaviLyte-N, the solution may be given by nasogastric (NGT). NGT administration is at the rate of 25 mL/kg/hour.